The H-4220F single-mass (10.1 lbs. ), foundation DCP is used to estimate the shear strength of weak soil with a CBR less than 20 and psf less than 4000. It can be used to assess the in-place strength of undisturbed soil and/or compacted materials. It can also be used to estimate the CBR (California bearing ratio), shear strength and thickness of the material. The H-4220F is ideal for horizontal construction applications, such as shallow foundations, footings and pavement shoulders. 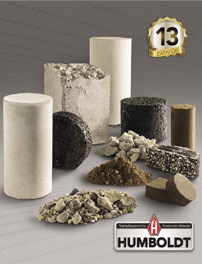 Typically it is used to assess material properties to a depth of 36 in (914 mm) below the surface. Also, with the use of 24" extensions this depth can be increased to 6 ft ( 2 m). The H-4220F comes with a 37.75" drive rod that is marked in 2" increments; a single-mass, 10.1 lb ( 4.5kg), sliding hammer and a reusable, hardened point. The drive rod and hammer are connected with a quick-connect pin. The Hammer drop is 22.6" (575mm) with a tolerance of 0.039in. (1.0mm). The hardened point has a 60° angle with a tolerance of 1°. The tip base diameter is 0.790" (20mm) with a tolerance of 0.010" (0.25mm).